jobs. There are total 71 posts in this NUHM Malegaon Municipal Corporation. Application form submission last date is 20-07-2018. Candidates selection for this NUHM Malegaon MMC recruitment is on basis of merit in qualifications and previous work experience. Preference will be given to the candidates who are residing at Malegaon Municipal Corporation. 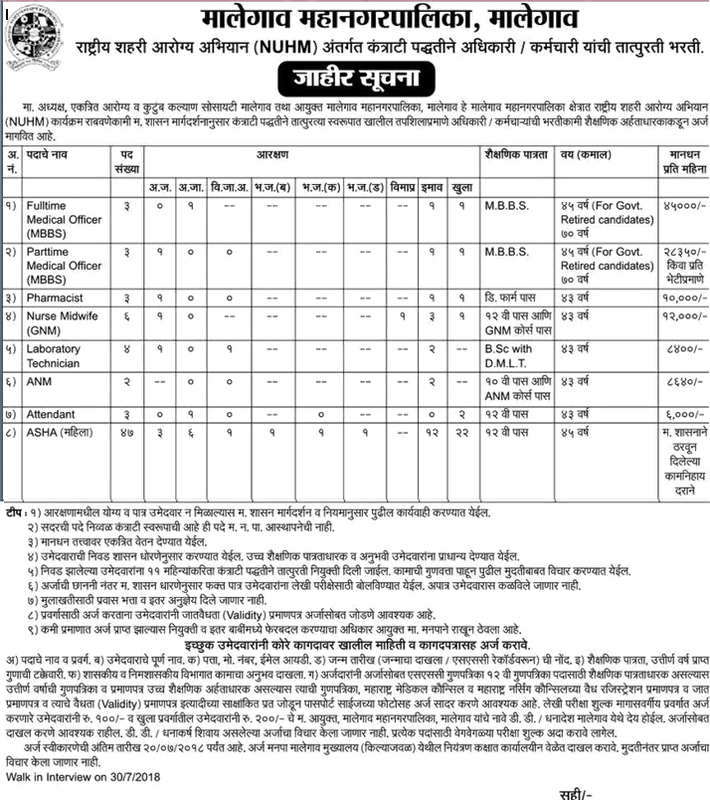 More information about this Malegaon Municipal Corporation recruitment of NUHM Vacancies qualification, age limits, application form submission process and other details are given below. Last date to application form submission is 20-07-2018. There are total 71 posts in this Malegaon Municipal Corporation NUHM recruitment 2018. Post Name, No of posts and Age limits are given below. Post wise qualifications are given below. For ASHA Workers and Medical officer posts are limits are 18-45 years and for all other posts age limits are 18-43 years. For reserved candidate application fee is Rs.100/- and for others Rs.200/-. Candidates can submit their application form in a prescribed format to Malegaon MMC NUHM along with all required documents copies on or before 20-7-2018. Candidate who are submitted application form within the date they have to attend the walk in interview on 30-7-2018. For address and other details refer official notification.